Mocean SMS Router offers Mobile Operator the ability to optimise network SMS handling capacity. SMS traffic would be routed to the Mocean SMS Router and it will attempt to deliver the message to the destination mobile subscriber. In the event that the delivery attempt fails, it will then only forward the SMS to the Mobile Operator’s SMSC for storage and forwarding process. This will immediately offload the operator’s legacy SMSC systems. 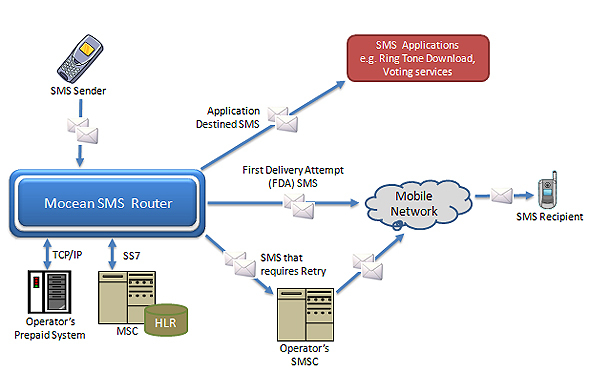 SMS based services traffic also do not require the resource intensive Store-and-Forward mechanism of legacy SMSC systems. SMS based services are services that can cause a huge spike in SMS traffic for a certain period of time. A good example is reality TV programs voting, where American Idol competition saw 78 million messages in their 2008 season. Mocean SMS Router will also be very useful during festive periods where SMS traffic is expected to surge many times above average. According to a report by Celluar-News.com, an estimated 43 billion text messages were sent globally over the 2007/2008 New Year period. Therefore in summary, Mocean SMS Router is capable to handle the scenarios that will cause a peak in the mobile network and offload the Mobile Operator’s legacy SMSCs.